Learn about the history, types, and production of Hungarian paprika. You’ll also find some authentic Hungarian dishes prepared the famous red spice. Paprika powder is produced by grinding the dried, deep red paprika pods of the pepper plant (Capsicum annum L. is the botanical name). Although paprika is the symbol of Hungary’s cuisine, the plant was brought to the country by the Turks only in the 16-17th centuries. Its pungency ranges from sweet to mildly hot and very hot, depending of the type of pepper the powder was produced. The colour of the spices varies from mild to bright red and there are paprika powder types with brownish colour too. Note that not the brightest red paprika is the hottest! The orange coloured one will make you really cry. The hotness is caused by capsaicin, a chemical that is extracted from paprika plants to use in pharmaceutical production due to its pan killer effect. He and his colleagues worked at the laboratory of the Szeged University. Szent-Györgyi and his colleagues experimented with the paprika plant and they extracted vitamin C first in the world form the vegetable. Would you think that even pálinka (distillate) is made from paprika? If you want to learn how to make authentic local dishes and find out more about the local gastronomy, attend a Hungarian Cooking Course held in a modern cooking school in Budapest’s center. English-speaking young chefs will help you prepare a typical Hungarian menu that you can eat at the end of the course. You can reserve your Hungarian Cooking Class online here. The Turks introduced the pepper plant to Hungary during their rule in the 16th-17th centuries. At first it was regarded and used as an ordinary plant and decorated the gardens. Shepherds and herdsmen who had more contact with the invaders started spice their meals with the fiery powder. Then paprika got to the kitchens of the peasants. Aristocrats found the peasant foods flavoured with the red spice very tasty and slowly they started to use it too. By the 19th century paprika became a dominant spice in Hungarian kitchens and restaurants. Due to the favourable climate, and geographical conditions Hungarian paprika has a bright red colour and a distinctive rich flavour that allowed Hungary to became one of the leading producers in the world. Kalocsa and Szeged in the southern part of Hungary are the heart of production in Hungary. These regions have the highest amount of sunny hours a year, and the plants need lots of sunshine to get ripe and sweet. Ripe peppers are harvested in September. Kalocsa, Szeged and the neighboring villages are adorned with bright red, threaded paprika strings, hung from the fences and porches. Farmers used to hung the strings in a rainproof area and let them desiccate by the sunshine then dried them in earthenware ovens. Today the fresh peppers are dried artificially in ovens. The dried pods were crushed by foot then ground into a fine powder using a mortar and a pestle. Water mills and later steam-powered mills replaced the manual kulu towards the end of he 19th century. During the first decades of paprika production the pungency of the powder couldn’t be controlled. The pepper’s veins and seeds that contain the capsaicin responsible for its pungency were manually removed from the dried, crushed pods prior to grinding. Not only the process was lengthy, but some capsaicin always remained in the pods which made it impossible to predict the hotness of the powder. In the mid 1800-ies the Pálfy brothers from Szeged invented an efficient way to remove the veins and seeds thus enabling mass-market production of sweet paprika that has always had a larger market than the hot types. Ferenc Horváth and Jenő Obermayer form Kalocsa developed the first non-pungent pepper variety in the world through cross-breeding. This pepper type is sweet and there’s no need to remove the veins and seeds. Today automatic machines do everything from sorting, washing, grinding to packaging. 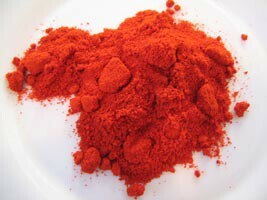 Many farmers make paprika powder at home to this day, especially in the villages in the Great Plain. The best source is of course its homeland, Hungary, so if you visit our country stock up on this red spice. In the Great Market Hall or in any other market in Budapest you can get it in beautiful packets, they are nice souvenirs. 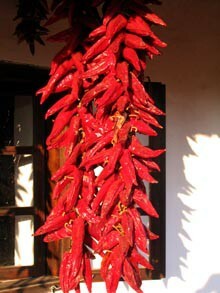 A string of red paprika will enhance your kitchen’s decoration. To buy real good, homemade paprika powder for less, look for peasants (usually women wearing kerchiefs on their heads) selling it in plastic sachets in the markets. Homemade paprika has more deeper colour and richer taste and aroma. You can also get good Hungarian paprika in any grocery shop. Put some Paprika paste in your shopping cart too. It’s made from minced paprika and it’s often added to Hungarian-style dishes or served with the meal. Outside Hungary look for shops selling imported spices. They surely have Hungarian paprika in stock, browse the spice shelves of the big supermarkets too. Storage Tip: Purchase paprika powder in small quantities and store it in a cool, dry place, in an airtight container away from sunlight and heat to prevent it from going stale! fresh peppers are also pickled. 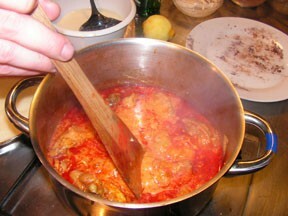 Braising chopped onion in oil or lard, and adding paprika powder you get the base of many Hungarian dishes, including pörkölt (stew). To release the full flavour and aroma, you have to add it to hot lard or oil, but pay attention because it can easily get burnt because of its sugar content. Burnt paprika tastes bitter and can ruin the whole dish. To be on the safe side, turn the heat under the pan to the lowest level or remove the pan from the heat while you add the paprika to the hot oil and stir the mixture continuously. Quickly add the meat or vegetable (potato, mushroom etc.) and some water or other liquid (it can vary from recipe to recipe) to the paprika gravy to reduce the heat. Now you can put the pan back to the heat and continue cooking according to the recipe. 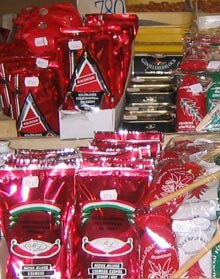 Paprika is added to countless dishes in Hungary from soups to sauces and stews. In some parts of the country it’s used as a filling in a sweet pastry. Paprikás csirke received its name from the red powder. It’s a major spice in the world-famous, hearty soup,the Hungarian Goulash. See our Hungarian Christmas Recipes page for instructions how to make Stuffed cabbage and Fishermen’s soup that are made with paprika too. Download A Taste of Hungary ebook, and you’ll have a unique collection of authentic recipes with colourful photos. 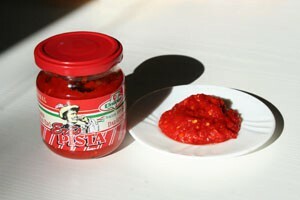 Kadarka enhances the best the taste of paprika in Hungarian dishes. This red grape used to be a major component in the famous Bikavér (Bull’s Blood) but the communist regime almost made it disappear from Hungarian vineyards. Luckily some talented vine makers have started to revive this great red. Kadarka is a full-bodied wine, with a slightly high tannin content. The rich, spicy aromas makes Kadarka a perfect wine choice to accompany dishes made with paprika powder. TIP: The best Kadarka-s come from the Szekszárd region (southern Hungary). See some wine shops in Budapest where you can buy the above wines.